Time: In Greece, GMT stands for Greek Maybe Time. Nothing is too urgent to require immediate attention so expect someone you are going to meet to be late. The siesta, which takes place between about 2pm and 5pm, is built into the day, and in many villages, the Sunday volta - or promenade in the French sense of the word - is still the highlight of the week, when villagers have a walk to pass the time of day and boys watch girls go by. The common sight of unfinished houses in Greece, with girders sticking out of the top floor, is a testament to the Greeks' relationship with the future; enough of the house is made ready for the family's present needs; when they need more room, they just build more. Cinemas: In summer, most cinemas in Greece are outdoors and have bars selling whisky, cognac, ouzo and snacks. There is also an intermission halfway through the film so you can replenish your drinks and decide whether you are enjoying the movie. The projectionist won't have to wait until the intermission for his cigarette. Smoking is allowed throughout the show in Greek cinemas. Unlike some other European countries, Greece does not dub foreign films into Greek but uses subtitles instead. Coffee: Known as Turkish coffee until 1974 when Turkey invaded Northern Cyprus. 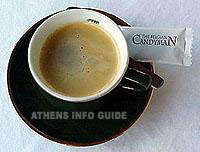 The coffee you get in Greece is not for the faint-hearted. The young in Greece prefer frappé, instant coffee with milk. In villages, the kafeneion, or local cafe, is the local gossip point, where Greek men go to play tavli, or backgammon. Until the early '80s, there were always at least two kafeneia in every village, no matter how small it was. Each one was decorated with different colors, signaling the political leanings of the kafeneion owner. This way you avoided political quarrels. In larger towns and cities, local coffee bars still deliver trays of coffee on foot to local businesses. Eating habits: Cross-generational dining, with grandma and small children of the same table, is always more entertaining even if' it does take longer. The Greeks aren't in a hurry where food is concerned, late night dining means sitting down to the evening meal no earlier than 9pm. Even on Sunday nights taverns are packed until late. Eating alone is unheard of so the solo diner will find it hard to get served. Meals in restaurants are paid for in cash, not credit cards or cheques and Greeks always have enough money on them to pay for others. Island hopping: Greece has 227 inhabited islands divided up into seven island groups: the Ionian Islands, the Dodecanese, Crete, the Cyclades, the Saronic, the North Eastern Aegean Islands and the Sporades. An impressively efficient ferry system operates between the island groups and Greeks island-hop for weekends away. In fact, the islands may be the reason Greeks are so reluctant to holiday abroad and who can blame them? August is best avoided by those who hate crowds. Attempts at traffic solutions: Instead of an administration-heavy congestion charge, Athens instituted a system of driving days a few years ago, whereby motorists can only use their cars every other day, as dictated by the last digit of their number plate. This was aimed at combating both congestion and pollution. Unfortunately, the canny Athenians got round the restriction by buying a second car (often second-hand and therefore more likely to pollute) with the opposite number plate. Nice try though. The Athens metro, another traffic solution, could be seen as the eighth wonder of the world, and not only because it's a wonder they ever finished it at all. Finally opened in January 2000, the new subway system looks like a museum. Check out the station under Syntagma Square for the highest concentration of ancient exhibits. The luck of being born female: Most Greek parents build a house for each daughter but not for their sons as they are supposed to marry a girl who will get a house from her parents. Often it is also the daughter that inherits her parents' or grandparents' house when they die. Do expectant Greek parents pray for sons? Name days: Few people in Greece celebrate their birthdays but almost everyone celebrates their Name Day. This custom stems from the Greek Orthodox religion in which all children are baptized with a name that is acceptable to the church. This means that most names in Greece are those of saints or of some holy quality. Clearly the list of saint names is limited and when added to the tradition of naming children after their grandparents, you will find a fairly defined set of names in Greece. Each name has a day, based on the day when the saint was born into the life hereafter, usually through an act of martyrdom. Thus, on your name day everyone you ever knew (and those you barely know or remember) will call you, stop by your house or otherwise contact you to wish you the best. If you're feeling especially celebratory, you'll take your friends out for drinks or dinner - but you have to get the bill. Each Greek Orthodox Church is also named after a saint, therefore there are community celebrations on the appropriate name days. These celebrations, panigiria, include food, fireworks, and fairs. Plate Smashing: The Greeks love to throw things. They throw carnations to singers and smash glasses and dishes when beautiful girls dance the zeibekiko or the hasapiko on the dance floor. Back in the '30s they used to throw knives, a sign of respect and manhood, at dancers' feet. Due to injuries, that tradition gradually changed to the present-day plate-throwing tradition, which has stuck. Luckily the Greeks take their recycling seriously, so it's not a complete waste! Wacky beliefs: Superstitions and strong religious beliefs always make life more interesting. When Greeks move into a new house, the local priest comes over to exorcise and bless it. In Greece, Tuesday the l3th is the unlucky day (not Friday) because it is the day on which Constantinople fell to the 'Ottoman' Turks. Periptera: Incredibly useful street kiosks that sell everything from tobacco to cold drinks, maps, newspapers, key rings, ice creams, worry beads and hundreds of other things. It's always worth asking if they have something as they probably will! There are around 46.000 of these kiosks in Greece.